Dimensions 0.75 by 6 by 7.75 in. Amazon.com description: Product Description: Hold on to your umbrella and stock up on marshmallows Ã¢ÂÂ Judy and Stink face wicked weather in their third full-color adventure. 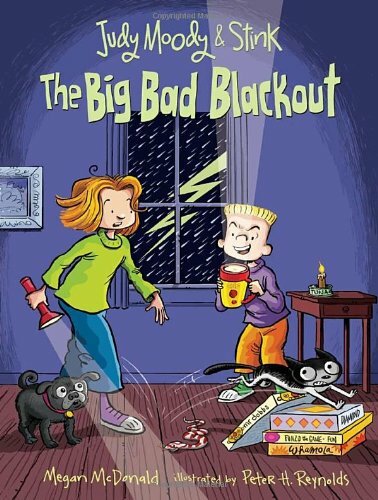 Judy and Stink and the whole Moody family hunker down with beans and batteries, ready to wait out the storm. But along with massive rain and strong winds, Hurricane Elmer throws down ghosts, squirrels, and aliens. Spooky! Just when things couldnÃ¢ÂÂt possibly get any freakier Ã¢ÂÂ flicker, flicker, gulp! Ã¢ÂÂ the lights go O-U-T out. The Moodys are smack-dab in the middle of a big bad blackout! Grandma Lou proposes musical board games and some good old-fashioned storytelling. Will Hurricane Elmer go down in Moody family history as bad news, a happy memory, or simply an LBS (Long Boring Story)? About: Hold on to your umbrella and stock up on marshmallows â Judy and Stink face wicked weather in their third full-color adventure.